Dr Wayne Sylvester is an Assistant Professor and a small animal clinician in the Small Animal Medicine and Surgery Academic Program in the School of Veterinary Medicine at St George’s University. 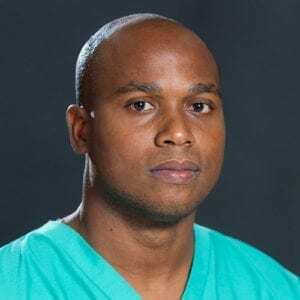 He obtained his Doctor of Veterinary Medicine Degree in 2004 from the School of Veterinary Medicine, University of Camaguey, Cuba and is currently pursuing a Masters of Science Degree in Animal Product Processing, Entrepreneurship and Safety at St. George’s University. Dr Sylvester’s research interest areas are vector-borne diseases and zoonotic infectious diseases. He is the Faculty Advisor for SVM Veterinary Public Health Committee and a member of the SVM Community Outreach Committee. Sylvester, W.R.B., Amadi, V., Hegamin-Younger, C., Pinckney, R., Macpherson, C., McKibben, J., Bruhl-Day, R., John-Sylvester, K.D., Hariharan, H. 2014. Occurrence of antibiotic resistant Escherichia coli in green iguanas (Iguana iguana) in Grenada, West Indies. Accepted March 11th 2014 by International Journal of Veterinary Medicine - Research & Reports. Sylvester, W.R.B., Amadi, V., Pinckney, R., Macpherson, C., McKibben, J., Bruhl-Day, R., Johnson, R., Hariharan, H. (2013). Prevalence, serovars, and antimicrobial susceptibility of Salmonella spp. from wild and domestic green iguanas (Iguana iguana) from Grenada, West Indies. Zoonoses Public Health. Published online. DOI: 10.1111/zph.12093. Yabsley, M.J., McKibben, J., Macpherson, C.N., Cattan, P.F., Cherry, N.A., Hegarty, B.C., Breitschwerdt, E.B., O’Connor, T., Chandrashekar, R., Paterson, T., Lanza Perea, M., Ball, G., Friesen, S., Goedde, J., Henderson, B., Sylvester, W. 2008. Prevalence of Ehrlichia canis, Anaplasma platys, Babesia canis vogeli, Hepatozoon canis, Bartonella vinsonii berkhoffii and Rickettsia spp. in dogs from Grenada. Veterinary Parasitology 151. 279-285. 2008. Prevalence and antibiotic susceptibility of Salmonella serovars in selected domestic and wildlife species in Grenada.